ENERCO can provide the complete package solution for projects of any size that involve aluminium structures – whether it be a shop front with manual doors to a full automatic entrance system. Delta Glaze Aluminium entrance doors are an attractive façade, while still offering top-class security and thermal properties. We also offer access control systems and a range of other doors – such as steel doors, roller shutter doors, sectional doors and high-speed doors. (Link to other header pages). 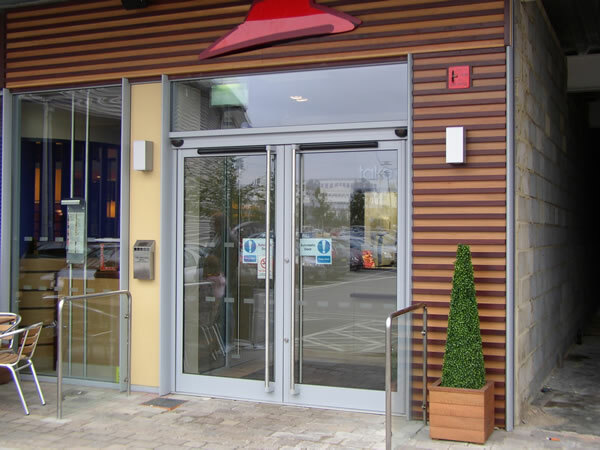 Swing/sliding doors are probably the most effective option for retail and commercial premises – such as office buildings, shops, restaurants, garden centres, fitness clubs and health centres – because of the need for automatic opening and closing. They can be made to fit almost any practical sized opening. All of our ENTRANCE DOOR products are supplied with a two-year parts and labour warranty, as standard, providing the equipment is maintained in accordance with the manufacturer’s recommendations and not modified in any way. To help protect your investment, full maintenance packages are available. The door must be serviced at least once a year. ENERCO recommends that a service be done six months after installation. Full details of the servicing requirements are available.